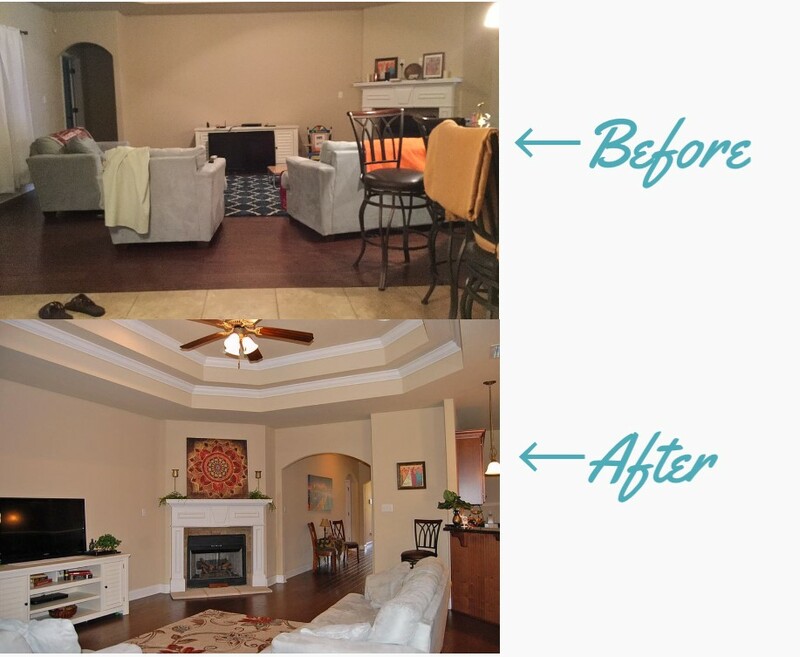 Home Staging means preparing a home for sale by making the home appealing to the highest number of potential buyers. Unlike decorating, staging is not about personal style, it is about creating inviting spaces to inspire buyers. The most important thing you can do to prepare your home for sale is to get rid of clutter. As the Old adage goes, for every new item that comes in, an old one has to leave. One of the biggest contributors to a cluttered look is having too much furniture. When professional stagers are preparing a home for market, we often suggest the sellers take away as much as half of their furnishings. The home will look much bigger for it. This approach may seem drastic, but try to take a good look at what you have and ask yourself what you can live without. After all, you are moving anyway. To make a room appear bigger, paint it the same color as the adjacent room(s). If you have a small kitchen and dining room, a seamless look will make both rooms feel like one big space. Try using the same neutral paint color in all of the first rooms you see when you enter the home for a better flow. One of the most important things that make staged homes look so warm and welcoming is great lighting. To help with this problem, increase the wattage in your lamps and fixtures, and don’t depend on just one or two fixtures per room. Make sure you have several different types of lighting including overhead, pendant and table and wall lamps. Painting a living room a fresh neutral color helps tone down any dated finishes in the space. Consider painting in a warm, neutral hue. These days, the definition of neutral can extend way beyond beige, from warm tans and honeys to soft blue-greens. As for bold wall colors, they have a way of reducing offers, so go with neutrals in large spaces. Mixing the right accessories can make a room more inviting. When it comes to eye-pleasing accessorizing, odd numbers are preferable, especially three. Scale is important, so in your group of three be sure to vary height and width, with the largest item at the back and the smallest in front. For maximum effect, group accessories by color, shape, texture or some other unifying element, stagers suggest. Not only does good landscaping give you the highest return on your money, but it also can literally transform the exterior look and feel of your home. 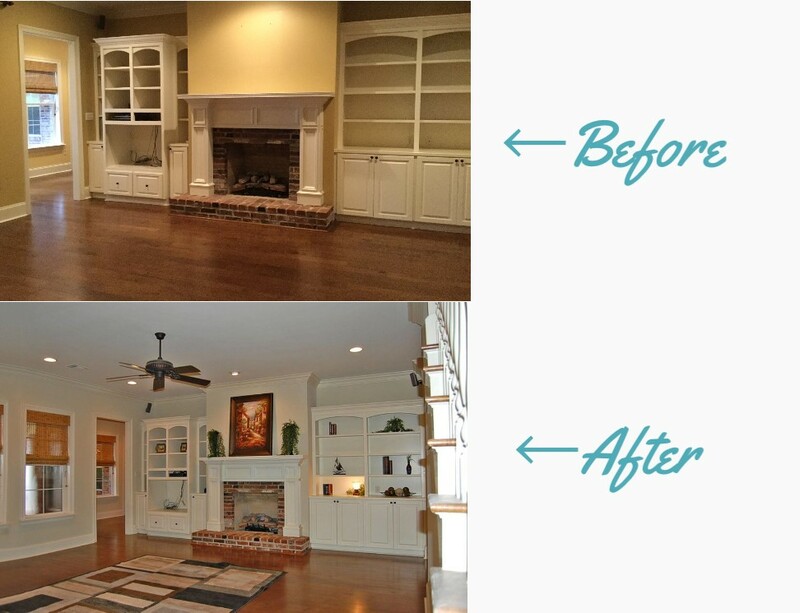 So take a look at some of the before and after pictures below and let us know how we may help you prepare your home for listing!